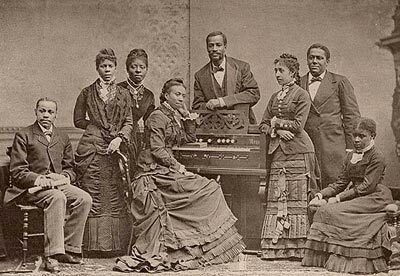 Taking every penny from the school treasury to pay for their traveling expenses the Fisk Jubilee Singers set out on a mission to ensure the continuance of the school they dearly loved. Only a few months after the end of the Civil War John Ogden, the Reverend Erastus Milo Cravath, and the Reverend Edward P. Smith (their stories are inspiring in themselves) founded the Fisk School in Nashville–so named for the Tennessee Freedmen’s Bureau General Clinton B. Fisk who donated Union army barracks to be used as the first facilities to educate the impoverished people of the South aged 7 to seventy. The school was open to all races, but quickly attracted ex-slaves only a few years after emancipation. Always teetering on bankruptcy the school decided to let the spiritual songs of God determine its fate. After a rough start the singers rose to stardom bringing US Grant, Mark Twain and Queen Victoria to tears. The school survived, but more importantly their faith and music remains a testament to the power of music to win hearts and minds and to the selfless generosity of the founders of Fisk University. What a fantastic post! Thanks so much for telling about this, esp. with the music clip.